After two years of being active and playing shows at Jazz festivals, venues and music schools, Junkey Moneywise, a progressive/modern jazz trio from Nicosia, presents a series of shows named "Awakening", in most major cities of the island in March. "Awakening" is the musical result of this “two year” journey and it is entirely made up of original compositions of the band, planned to be recorded in 2019. 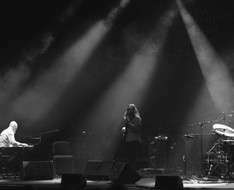 The live performances of the trio have received major critical acclaim, mostly due to the highly energetic style of their members' playing, with polyrhythmic and complex passages leading to more atmospheric, downtempo parts, combining the European Jazz influence with neo-soul, latin jazz and even Eastern Music in their compositions. Vasilis Vourvopoulos has acquired Piano, Harmony and Counterpoint Diploma. He later continues his studies at Middlesex University in London where he acquired his BA in Music focusing in Piano Performance. In the past few years he composed and arranged music for Theatre and he is a performing musician for artists both from Cyprus and Greece. He teaches theory and harmony at Arte Music Academy and both theory and piano at the Hellenic Conservatory of Music. Markos Ioannou is performing professionally as a drummer with several artists and bands since the age of 16. He studied modern music in LAB Music Education in Athens, while playing regurarly all over Greece in various shows and concerts. In 2012 he returned to Cyprus and since then he works as music educator, while performing regularly in various bands in Cyprus and abroad. Marinos Kassinos studied Music in the University of Salford in Manchester, with a Masters degree in Composition. In 2010 he returns to Cyprus where he performed professionaly with multiple bands and artists while also composing music for theatre, tv and radio. Since 2011 he works as a music tutor and performer.